Day 14: Gobble Gobble, originally uploaded by Here Be Dragons. My photo for today: a visitor we had this morning . . . It's not unusual to see turkeys in my neighborhood. About three years ago, a large flock of them showed up, and I've seen them regularly ever since; over time I've seen them more and more frequently, too. I hear them outside most mornings; their call really does sound a lot like, "gobble gobble gobble gobble gobble gobble." It's hilarious to hear them, and - best of all - if Connor or I gobble at them, they'll usually gobble back. (Sometimes we'll do this from the car - we'll be driving and see them by the side of the road - or in the middle of the road - and I'll roll down the window so Connor and I can shout, "GOBBLE GOBBLE GOBBLE," and they'll "GOBBLE GOBBLE GOBBLE" right back at us. Hilarious. Well, this morning after breakfast, I could hear some turkey noises outside. It sounded like they were out front, and judging by how loud the calls were, I figured they had to be in our front yard. So, Connor and I went outside to see . . . but no sign of any birds. Hmnh. Okay, so they must be in the backyard, then. So, we went out back. Still no birds. Huh? That's bizarre, because the gobbling sounded really close - there's no way the turkeys could have moved out of range so quickly. (They're not particularly speedy birds). Well, I was all the way at the end of our patio, looking out over the hills behind the house, and when I turned to go back inside, I spotted our visitor. On the roof. 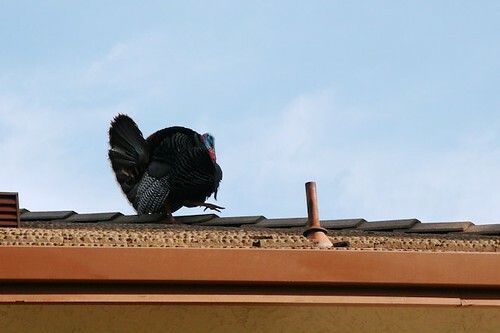 :D I guess that explains why the sound of the gobbling was so loud inside the house - she was RIGHT over my head. Of course, I snapped a few pictures. The one in this photo, actually, isn't the first bird I saw up there. After taking Connor to school, I came home to find three more turkeys in the front yard. When I drove up, the one in this picture flew up to join the first bird on the roof. (I suspect that maybe some mating behavior was involved). So, I brought out the camera again. (I also took a few shots of the birds that stayed on the ground; I hope the neighbors weren't watching, because I had quite the conversation with them, trying to get them to pose for me. My promises of putting them "on the internet" didn't seem to have much effect. I guess they're not tech-savvy enough to care about that). I love the turkeys. They're huge, and sort of pesky (and they're not actually native to this area, which isn't great - I don't think they're really displacing the native quail, though. At least I hope they're not). But they're funny and loud and . . . well, you've just got to love coming home and finding a flock of gigantic birds out in the yard. Or on the roof. Especially when they'll gobble back at you. The running joke is that they're just giving him that baleful look while thinking to themselves, "*SIGH* There goes another moron mooing at us."